Nottingham Forest player-coach Andy Reid says supporters are being "totally counter-productive" by booing the team. Kelvin Wilson was singled out by sections of the home crowd after a mix-up with keeper Dorus De Vries led to a Brentford goal in Saturday's game. 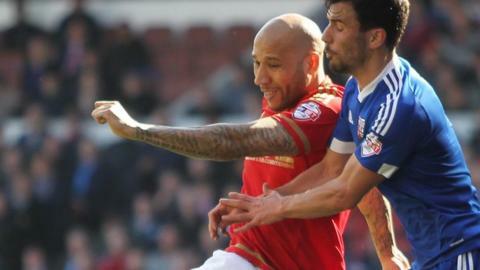 There were also boos at full-time as Forest slipped to 16th in the table following their 3-0 defeat. "It doesn't help anybody. We can understand the frustration, but we need them on our side," Reid said. Talking to BBC East Midlands Today, injured midfielder Reid continued: "Fans do have the right to an opinion. Fans have always been good and very good to me, so I will never slag them off in any way, but it is totally counterproductive. "We are trying to achieve the same thing, we want to win football games as much as they do. "We urge fans, and I know it's difficult when we are not playing well, to get behind us as much as they can because we need it." Forest, who finished the game with 10 men following Eric Lichaj 's sending-off, have lost seven of their last nine games, winning just one during a run that saw manager Dougie Freedman sacked and Paul Williams put in charge. Following Freedman's departure, Forest previously held Championship promotion hopefuls Hull City to a draw and produced a battling performance in a 1-0 defeat to near neighbours Derby County. "Although the performance was not there Saturday, the two before that were positive," said Reid, who joined the coaching staff at the City Ground after Freedman's exit. "We want to go on good run from now until the end of the season to take with us into next season, regardless of who the manager is." They next face Reading at the Madejski Stadium on Tuesday.